Yesterday at AMD’s 2017 Financial Analyst Day the company outlined its plan to re-enter the high-performance x86 server market. 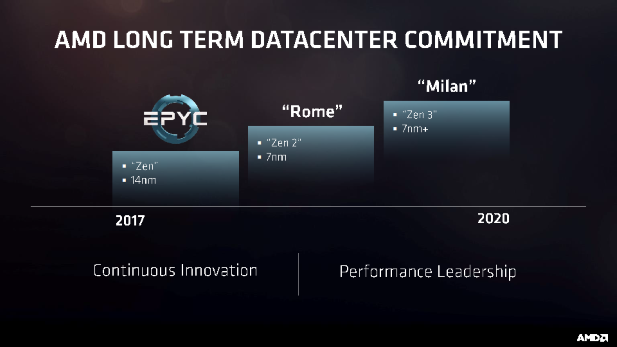 AMD’s first “Zen”-based server chip codenamed “Naples” will be coming to market branded as AMD Epyc. As of press time every spell checker we’ve tried rejects this specific spelling of the word epic. 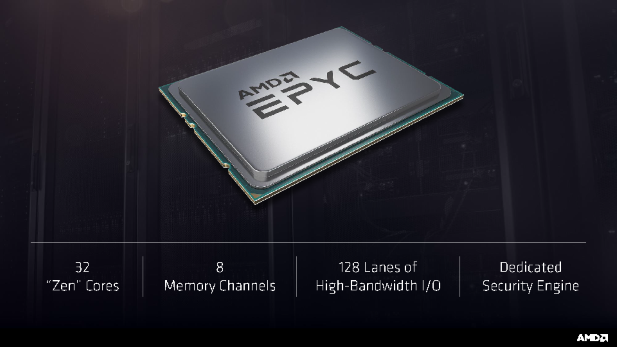 AMD’s Epyc uses four “Zepplin” dies inside of multi-chip-module to offer up to 32 cores, 8 memory channels, 128 lanes of PCI-E, and a fully integrated chipset in a single socket. AMD’s Epyc will see general availability starting in June. 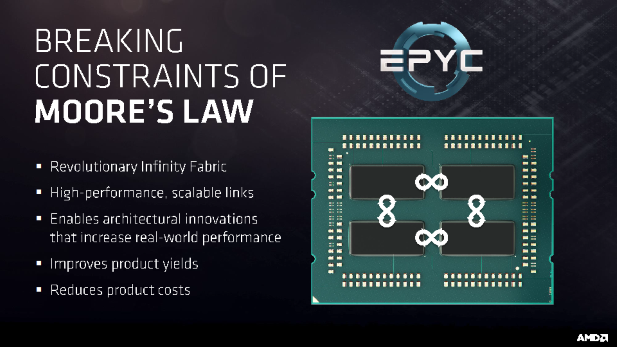 At the core of what makes Epyc so epic is AMD’s Infinity Fabric which enables coherent data movement using an enhanced version of AMD’s old HyperTransport protocol. In addition to a robust and scalable data fabric there’s also the control fabric which manages all the different IP blocks on this massively complex and perhaps even Epyc chip. 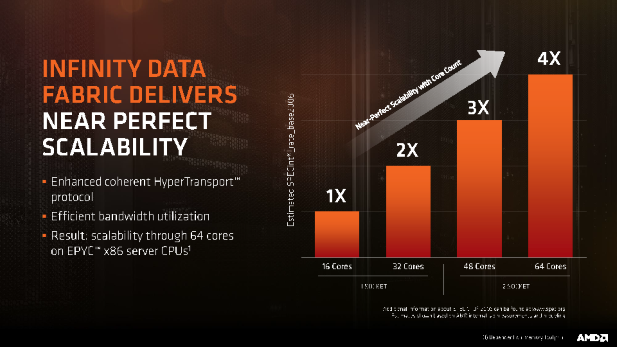 The outcome of all the technology that AMD’s packed into its fabrics is near linear performance scalability in the SPEC CPU 2006 benchmark when moving from 16 to 64 total cores in a system. 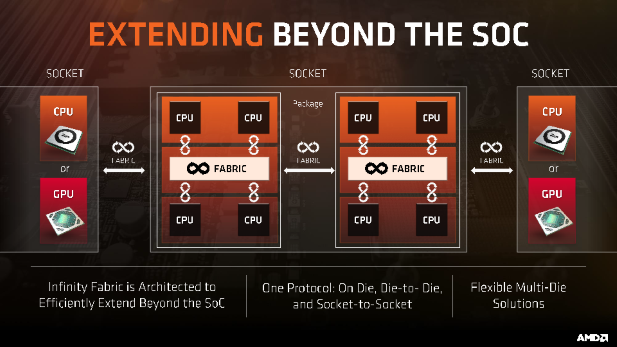 AMD is also promoting its Infinity Fabric as more than just an intra-package interconnect solution but also as a way to communicate externally with other sockets and even with GPUs. Coincidentally AMD’s RX Vega GPUs will also use the Infinity Fabric both internally and externally. Given the importance of the Infinity Fabric to AMD’s server efforts it’s beginning to seem like AMD’s acquisition of SeaMicro may have borne more fruit than we first thought. 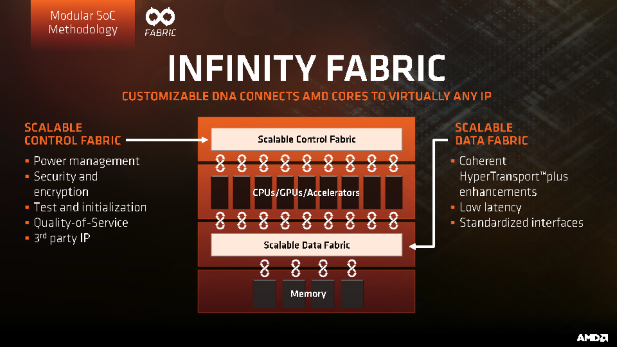 UPDATE 5/22/17 11:15 PM CT: AMD has asked us to clarify that Infinity Fabric is actually not related to any of the IP or work that AMD inherited through its ill-fated and SeaMicro acquisition. AMD is still being rather coy with its plans for updates to the “Zen” CPU core. But the company did list two process nodes under the current revision of the core implying we’ll see some incremental updates before we see a new generation. The next big architectural update will come with “Zen 2” sometime in 2018 which will arrive alongside the 7nm process node. Apparently, AMD expects to spend the bulk of 2018 and 2019 on various revisions of the 7nm process node. Finally, “Zen 3” will come to market in 2019 to tide us over until AMD’s ready to hold its next Financial Analyst Day in 2020. 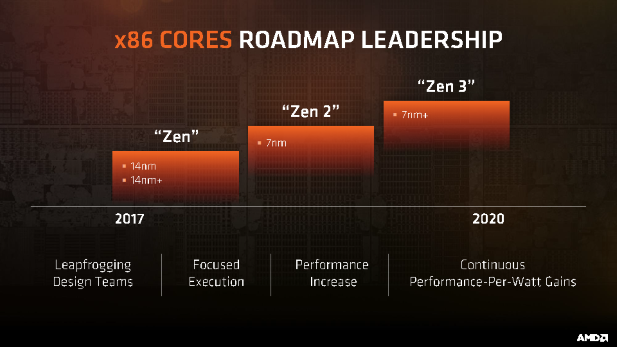 Obviously, AMD’s being pretty vague about its timeline for this architectural roadmap; but given how cool “Zen” sounds it’s unfortunate that they couldn’t come up with something more fun that “Zen 2” and “Zen 3”. Oh well, maybe next time. Moving back to products, AMD laid out a solid server roadmap today with an update set for next year dubbed “Rome” and another for 2019 called “Milan”. Unlike AMD’s consumer facing product lines, updates to the server lineup appear to coincide with major architectural updates like “Zen 2” and “Zen 3”. “Naples” will be AMD’s only 14nm high-end server chip with a quick transition to the 7nm node for both “Rome” and “Milan”. 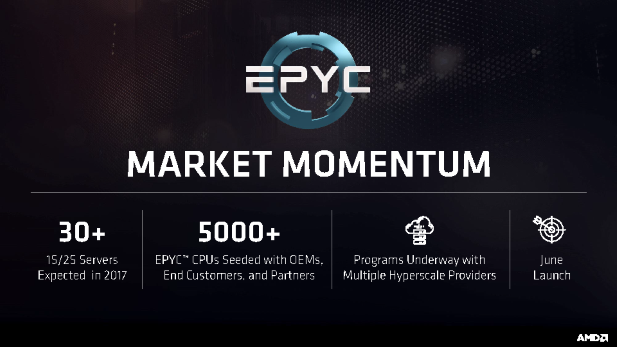 AMD’s goal with Epyc is to shake up the server market by converting a significant portion of the two-socket market into single socket solutions thanks to the massive core count of its new chips. 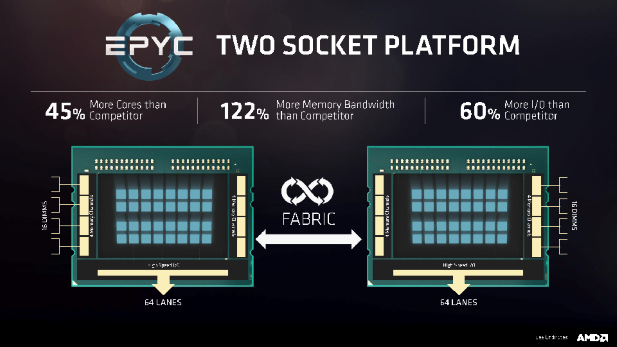 AMD believes that single socket Epyc solution are a better choice than competing dual-socket solutions from Intel because 1S Eypc systems will be physically smaller, offer more cores, more PCI-E lanes, lower power consumption, and a reduced total cost of ownership compared to the best-selling Intel Xeon E5 V4 parts on the market. AMD is also highlighting its commitment to avoiding the kind of anti-consumer and completely unnecessary product segmentation that Intel engages in by fusing off features on its chips with the goal of upselling customers who need specific feature sets. 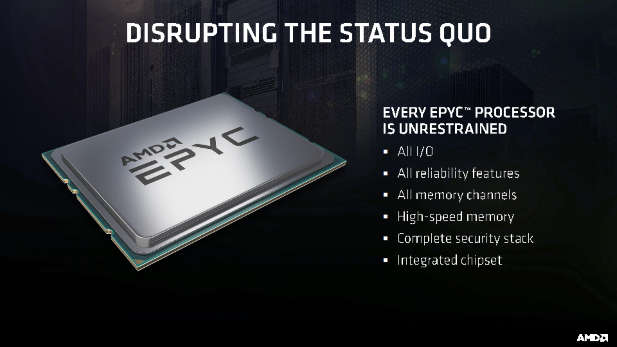 All of AMD’s Epyc chips will be available with the same basic feature sets like secure virtualization, RAS, and I/O. As far as industry support goes AMD is touting over 30 design win set to come to market in 2017. This is a decent start for a company that hasn’t been a player in 3 years. More importantly AMD has sampled over 5000 Epyc chips to its partners which is exactly the kind of bring up effort that’s required to avoid the teething problem that AMD’s Ryzen chips faced on the desktop. Intel has already offered a partial response by reminding partners about its soon to arrive Skylake-EP product update and its new branding scheme. What many are still pondering is AMD’s ability to take back mindshare from Intel in the server space. Next month’s graduating class of physics and computer science majors started and finished their degrees in an environment where Xeon was the only option for CPU compute. The sales team inside AMD’s Enterprise, Embedded, and Semi-Custom business group certainly has their work cut out for them.